New Delhi: Atal Bihari Vajpayee was a colossus in the political firmament of India.Born on December 25, 1924, he was the 10th Prime Minister, first for 13 days in 1996 and then from 1998 to 2004. One of the founders of the Bharatiya Janata Party, he was the first non-Indian National Congress Prime Minister to serve a full five-year term. At 93, Vajpayee was the oldest living former Indian Prime Minister. He was elected to the Lok Sabha 10 times, and twice to the Rajya Sabha. Vajpayee also served as MP for Lucknow, until 2009, when he retired from active politics due to health concerns. He was one amongst the founder members of erstwhile Bharatiya Jana Sangh, which he had also headed. He was also the Minister of External Affairs in the cabinet of Morarji Desai. When Janata government collapsed, Vajpayee restarted the Jana Sangh as the Bharatiya Janata Party in 1980. In December 25, 2014, he was named for the Bharat Ratna award, India's highest civilian honour. His birthday, December 25, was declared Good Governance Day. Vajpayee was born to Krishna Devi and Krishna Bihari Vajpayee in Gwalior. His grandfather, Pandit Shyam Lal Vajpayee, had migrated to Morena, Gwalior, from his ancestral village of Bateshwar, Uttar Pradesh. His father, Krishna Bihari Vajpayee, was a poet and a schoolmaster in his home town. Vajpayee did his schooling from the Saraswati Shishu Mandir, Gorkhi, Bara, Gwalior. He graduated with distinction in Hindi, English and Sanskrit from Gwalior's Victoria College (now Laxmi Bai College). He completed his post-graduation with an MA in Political Science from DAV College, Kanpur, and was awarded a first-class degree. His activism started with Arya Kumar Sabha of Gwalior, the youth wing of the Arya Samaj, of which he became the general secretary in 1944. He also joined the Rashtriya Swayamsevak Sangh as a swayamsevak in 1939. Influenced by Babasaheb Apte, he attended the Officers Training Camp of the RSS during 1940?44 and became a "full-time worker" in 1947, technically a pracharak. He gave up studying law due to the partition riots. He was sent as a vistarak (probationarypracharak) to Uttar Pradesh and quickly began working for the newspapers of Deendayal Upadhyaya, Rashtradharma (a Hindi monthly), Panchjanya (a Hindi weekly) and the dailies Swadesh and Veer Arjun. Vajpayee never married and remained a bachelor his entire life. He had an adopted daughter. Vajpayee's first exposure to politics was in August 1942, when he and his elder brother Prem were arrested for 23 days during the Quit India Movement. He was released after giving a written undertaking, expressly declaring that they would not participate in the anti-British struggle, a promise that they kept. The words came to haunt Vajpayee later in his political life. In 1948, the Rashtriya Swayamsewak Sangh was banned for its alleged role in the assassination of Father of the Nation Mahatma Gandhi. In 1951, Vajpayee was seconded by the RSS, along with right-wing ideologue Deendayal Upadhyaya, to work for the newly-formed Bharatiya Jana Sangh. Vajpayee was appointed as a national secretary of the party in charge of the Northern region, based in Delhi. He soon became a follower and aide of party leader Syama Prasad Mukherjee. In 1954, Vajpayee was with Mukherjee when he went on a fast-unto-death in Kashmir to protest against perceived inferior treatment of non-Kashmiri Indian visitors to the state. Mookerjee died in prison during this strike. In 1957, Vajpayee lost to Raja Mahendra Pratap in Mathura for the Lok Sabha. But he was elected from Balrampur. There, his oratorial skills so impressed Prime Minister Jawaharlal Nehru that he forecast that Vajpayee would someday lead the nation. By virtue of his oratorical and organisational skills, he became the face of the Jana Sangh. After the death of Deendayal Upadhyaya, the mantle of the leadership of Jana Sangh fell on the shoulders of a young Vajpayee. He became the national president of the Jana Sangh in 1968 and, along with Nanaji Deshmukh, Balraj Madhok and Lal Krishna Advani, led the Jana Sangh to national prominence. Vajpayee's rise paradoxically followed the Internal Emergency imposed in 1975 by Indira Gandhi of the Indian National Congress. In 1977, heeding the call of social reformer Jayaprakash Narayan for all the opposition parties to unite against the Congress, Vajpayee merged the Jana Sangh into the newly formed grand-alliance, the Janata Party. Following Janata's victory in the 1977 general elections, he became the Minister of External Affairs in Prime Minister Morarji Desai's Cabinet. As foreign minister, that year Vajpayee became the first person to deliver a speech to the UN General Assembly in Hindi. 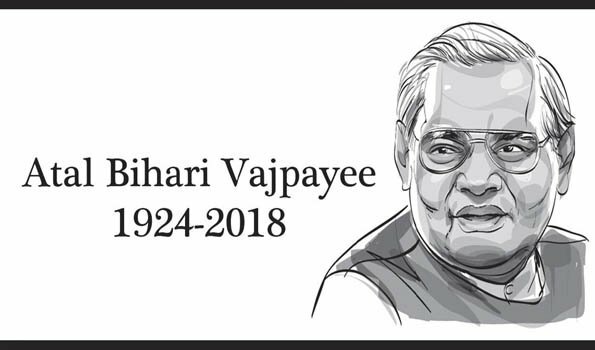 By the time the Janata government crumbled in 1979, Vajpayee had established himself as an experienced statesman and a respected political leader. Janata Party was dissolved in 1979 soon after Morarji Desai resigned as Prime Minister. The Jana Sangh had devoted its political organisation to sustain the coalition and was left exhausted by the internecine political wars within the Janata Party. Vajpayee joined many of his Bharatiya Jana Sangh and Rashtriya Swayamsewak Sangh colleagues, particularly his long-time associates Lal Krishna Advani and Bhairon Singh Shekhawat, in 1980 to form the Bharatiya Janata Party. He served as the BJP's first President. Vajpayee emerged as a staunch critic of the Congress (R) government that followed the Janata government.While the BJP opposed the Sikh militancy, it also blamed Indira Gandhi for her "divisive and corrupt politics that fostered the hot heads at the expense of national unity and integrity." The BJP was left with only two parliamentary seats in the 1984 elections. During this period, Vajpayee remained at the centre-stage as party President and Leader of the Opposition in the Parliament. The BJP became the political voice of the Ram Janmabhoomi Mandir Movement, which was led by activists of the Vishva Hindu Parishad (VHP) and the RSS, and which sought to build a temple dedicated to Lord Rama in Ayodhya. Victory in the state elections in Gujarat and Maharashtra in March 1995, and a good performance in the contest to the Karnataka assembly in December 1994, propelled the BJP to greater political prominence. During a BJP conference in Mumbai in November 1995, party president Lal Krishna Advani declared that Vajpayee would become the Prime Minister of India. The BJP won in the May 1996 parliamentary elections. Vajpayee served as the Prime Minister of India between 1996 and 2004 in three non-consecutive terms. The BJP grew in strength in the early 1995 riding on pro-nationalistic sentiments. In the 1996 general elections, the BJP emerged as the single largest party in the Lok Sabha. President Shankar Dayal Sharma invited him to form the government. Vajpayee was sworn in as the 10th Prime Minister of India, but the BJP failed to muster enough support from other parties to obtain a majority. He resigned after 13 days, when it became clear that he could not garner a majority. After the fall of the two United Front governments between 1996 and 1998, the Lok Sabha was dissolved and fresh elections were held. The 1998 general elections again put the BJP ahead of others. This time, a cohesive bloc of political parties joined the BJP to form the National Democratic Alliance and Vajpayee was sworn in as the Prime Minister.The NDA proved its majority in Parliament. The government lasted 13 months until mid-1999 when the All India Anna Dravida Munnetra Kazhagam under Jayalalithaa withdrew its support to the government. On 17 April 1999, his government lost the confidence motion in the Lok Sabha by a single vote. As the Opposition was unable to come up with the numbers to form the new government, the Lok Sabha was again dissolved and fresh elections were held. Vajpayee remained the Prime Minister until the elections were held. In May 1998, India conducted Pokhran-II underground nuclear tests in Rajasthan, 24 years after the first implosion. The tests were held just a month after the Vajpayee government had been in power. Two weeks later, Pakistan responded with its own nuclear tests. While Russia and France endorsed India's right to defensive nuclear power, others including the United States, Canada, Japan, Britain and the European Union imposed sanctions on information, resources and technology to India. In spite of the intense international criticism and the steady decline in foreign investment and trade, the nuclear tests were popular domestically. Effectively, the international sanctions failed completely to sway India's decision to weaponise their nuclear capability (especially as US sanctions against India and Pakistan were lifted after just six months), something that was planned for and anticipated by the Vajpayee government. In late 1998 and early 1999, Vajpayee began a push for a full-scale diplomatic peace process with Pakistan. With the inauguration of the Delhi-Lahore bus service in February 1999, Vajpayee initiated a new peace process aimed towards permanently resolving the Kashmir problem and other conflicts with Pakistan. The Lahore Declaration espoused a commitment to dialogue, expanded trade relations and mutual friendship and envisaged a goal of denuclearised South Asia. This eased the tension created by the 1998 nuclear tests, not only within the two nations but also in South Asia and the rest of the world. In mid-1999, the Vajpayee-led government was faced with two crises. The AIADMK had continually threatened to withdraw from the coalition and national leaders repeatedly flew down from Delhi to Chennai to pacify the AIADMK chief J Jayalalitha. However, in May 1999, the AIADMK did pull the plug on the NDA, and the Vajpayee dispensation was reduced to a caretaker status pending fresh elections scheduled for 1999 October. It was revealed that militants and non-uniformed Pakistani soldiers (many with official identifications and Pakistan Army's custom weaponry) had infiltrated into the Kashmir Valley and taken control of border hilltops, unmanned posts and were spreading out fast. The incursion was centred around the town of Kargil, but also included the Batalik and Akhnoor sectors and artillery exchanges at the Siachen Glacier. In 1999, the Bharatiya Janata Party-led National Democratic Alliance won 303 out of the 543 seats in the Lok Sabha, in the aftermath of the Kargil operations. On October 13, 1999, Atal Bihari Vajpayee took oath as Prime Minister of India for the third time. In December 1999, Indian Airlines flight IC 814 from Kathmandu to New Delhi was hijacked by five terrorists and flown to Taliban-ruled Afghanistan. The hijackers made several demands, including the release of Masood Azhar and other top terrorists. Under extreme pressure, the government caved in. Jaswant Singh, the Minister for External Affairs, flew with the terrorists to Kandahar, Afghanistan and exchanged them for the passengers. Vajpayee introduced many domestic economic and infrastructural reforms, including encouraging the private sector and foreign investments, reducing governmental waste, fostering research and development and privatisation of some public sector firms. The United Progressive Alliance Government on 1 July, 2013, accepted before the Supreme Court that the NDA dispensation led by Vajpayee had developed half the roads in last 32 years in their five-year term. Vajpayee's pet projects were the National Highways Development Project and Pradhan Mantri Gram Sadak Yojana. In March 2000, Bill Clinton, paid an official visit to India, the first by a US President in 22 years. It was hailed as a milestone in the relations between the two nations. Since the visit came barely two years after the Pokhran tests, and one year after the Kargil invasion and the subsequent coup in Pakistan, it was read to reflect a major shift in the post-Cold War foreign policy of the United States. Vajpayee and Clinton discussed strategic issues, but the major achievement was a significant expansion in trade and economic ties. The Historic Vision Document on the future course of relations between the two countries was signed by Vajpayee and President Clinton during the visit. Domestically, the BJP-led government was under constant pressure from its ideological mentor, the RSS, and the hard-line VHP to enact the Hindutva agenda. But owing to its dependence on coalition support, it was impossible for the BJP to push promises, including building the grand Ram Janmabhoomi temple in Ayodhya, repealing Article 370 which gave a special status to the state of Kashmir, or enacting a uniform civil code applicable to adherents of all religions. On January 17, 2000, there were reports of the RSS and some BJP hard-liners threatening to revive the Jan Sangh, the precursor to the BJP, because of their discontent over Vajpayee rule. Former president of the Jan Sangh, Balraj Madhok, wrote to the then RSS chief, Rajendra Singh for support. The BJP was, however, accused of saffronising education curriculum and apparatus. Also, Home Minister LK Advani and Union Human Resource Development Minister Murli Manohar Joshi were indicted in the 1992 Babri Mosque demolition case for inciting a mob of activists. Vajpayee himself came under public scrutiny owing to his controversial speech one day prior to the mosque demolition. The RSS also routinely criticised the government for free-market policies which introduced foreign goods and competition at the expense of 'swadeshi' industries and products. Vajpayee's administration earned the ire of many trade unions and government workers for its aggressive campaign to privatise government owned corporations. He promoted pro-business, free market reforms to reinvigorate India's economic transformation and expansion that were launched by former PM Narasimha Rao but stalled after 1996 due to unstable governments and the 1997 Asian financial crisis. Increased competitiveness, extra funding and support for the information technology sector and high-tech industries, improvements in infrastructure, deregulation of trade, investments and corporate laws -- all increased foreign capital investment and set in motion an economic expansion.Vajpayee's weakening health was also a subject of public interest, and he underwent a major knee-replacement surgery at the Breach Candy Hospital in Mumbai to relieve great pressure on his legs. In March 2001, the Tehelka group released a sting operation video named Operation West End showing videos of the BJP president Bangaru Laxman, senior Army officers and NDA members allegedly accepting bribes from journalists posing as agents and businessmen. Defence Minister George Fernandes was forced to resign following the Barak Missile scandal, another scam involving the botched supplies of coffins for the soldiers killed in Kargil, and the findings of an inquiry commission that the Government could have prevented the Kargil invasion. Vajpayee again broke the ice in the Indo-Pak relations by inviting Pakistani President Pervez Musharraf to Delhi and Agra for a joint summit and peace talks. His second major attempt to move beyond the stalemate involved inviting the man who had planned the Kargil invasions. But accepting him as the President of Pakistan, Vajpayee chose to move forward. However, after three days of much fanfare, which included Musharraf visiting his birthplace in Delhi, the summit failed to achieve a breakthrough when Islamabad declined to leave aside the issue of Kashmir. In 2001, the Vajpayee government launched the famous Sarva Shiksha Abhiyan, which aimed at improving the quality of education in primary and secondary schools.On December 13, 2001, a group of masked, armed men, with fake Identity Cards stormed the Parliament House in Delhi. The terrorists managed to kill several security guards, but the building was sealed off swiftly and security forces cornered and killed the men, who were later proven to be Pakistan nationals. Coming just three months after the September 11 attacks upon the United States, this fresh escalation enraged the nation. Although the Government of Pakistan officially condemned the attack, Indian intelligence reports pointed to a conspiracy rooted in the neighbouring country. Vajpayee ordered a mobilisation of India's military forces, and 500,000 servicemen amassed along the international boundary bordering Punjab, Rajasthan, Gujarat and Kashmir. Pakistan responded with similar steps. Vicious terrorist attacks and an aggressive anti-terrorist campaign froze day-to-day life in Kashmir, and foreigners flocked out of both India and Pakistan, fearing a possible war and nuclear exchange. For two years, both nations remained close to war. The Vajpayee administration also passed the Prevention of Terrorism Act against vigorous opposition of non-NDA parties. Human rights groups condemned the act which gave wide authority to the government to crack down and hold anybody. Its repeal was advocated by human rights organisations. Between December 2001 and March 2002, the Vishwa Hindu Parishad held the Government hostage in a major standoff in Ayodhya over the Ram temple. At the 10th anniversary of the destruction of the Babri mosque, the VHP wanted to perform a shila daan, or a ceremony laying the foundation stone of the cherished temple at the disputed site. Tens of thousands of VHP activists amassed and threatened to overrun the site and forcibly build the temple. A grave threat of not only communal violence, but an outright breakdown of law and order owing to the defiance of the government by a religious organisation hung over the nation. But to the relief of Vajpayee, his government was able to tide over this crisis. In 2002, Hindu-Muslim violence in the state Gujarat killed more than 1,000 people. Vajpayee officially condemned the carnage.Later, Vajpayee made controversial remarks, "Wherever there are Muslims in large numbers, they do not want to live in peace." The Prime Minister's Office clarified that the remarks were taken out of context. Vajpayee was accused of doing nothing to stop the violence, and later admitted mistakes in handling it. President KR Narayanan also blamed Vajpayee's government for failing to quell the violence.In late 2002 and 2003, the government pushed economic reforms, and the country's GDP growth accelerated at record levels, exceeding 6?7 per cent. Increasing foreign investment, modernisation of public and industrial infrastructure, the creation of jobs, a rising high-tech and IT industry and urban modernisation and expansion improved the nation's international image. Good crop harvests and strong industrial expansion also helped the economy. The government reformed the tax system, increased the pace of reforms and pro-business initiatives, major irrigation and housing schemes and so on. The political energies of the BJP shifted to the rising urban middle-class and young people, who were positive and enthusiastic about the major economic expansion and future of the country. He faced stiff opposition from other equally strong organisations in the Sangh Parivar such as the Bharatiya Mazdoor Sangh and the Bharatiya Kisan Sangh. Vajapyee continued with his aggressive economic reform policy. In August 2003, Vajpayee announced before Parliament his "absolute last" effort to achieve peace with Pakistan. Although the diplomatic process never truly set-off immediately, visits were exchanged by high-level officials and the military stand-off ended. The Pakistani President and Pakistani politicians, civil and religious leaders hailed this initiative as did the leaders of America, Europe and much of the world. In July 2003, Vajpayee, visited China and met with various leaders of the country. He recognised Tibet as a part of China, which was welcomed by Beijing, who in the following year, recognised Sikkim, as a part of India. China?India relations improved greatly in the subsequent years.